In English Grammar, the words may and might are the modal auxiliary verbs, which are used in sentences with other verbs to express tenses, voice, mood etc. As they both reflect the possibility of any event, there are instances when people use them interchangeably. It happens due to lack of proper understanding regarding how, when and where to use them. May can be used when there is a strong possibility of happening of an event. Astha may be in Jaipur; she might go to Jodhpur. Here, in the given sentence there is some sort of surety that Astha is in Jaipur. However, there are fewer chances of her going to Jodhpur. Now, come let’s discuss the difference between may and might in detail. Meaning May is a auxiliary verb, used to express a strong possibility of happening of an event, but still it is not certain. 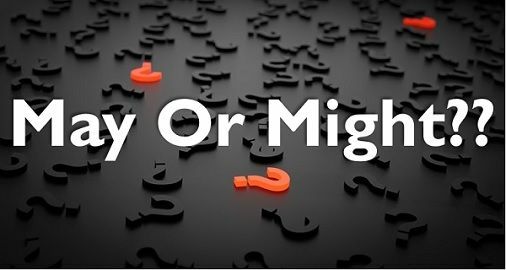 Might is a past form which is used in sentences when there is a possibility of occurrence of an event but to a smaller extent. Usage Used in situations which are factual and likely to happen. Used in situations which are hypothetical and unlikely to happen. Permission Seeking and granting permission. Seeking permission. Example I may be late today. She might get late to the office. May I get the required documents? Palak may be in the restaurant with her friends. Ajay may go to Australia at the end of this week. Monika’s parents might be upset to know her result. Tarun might be playing cricket. Aditya said that he might join the army. I brought her notebook, as I thought she might come to the class today. I wonder if I might have your pen? Might I invite you to the party? I think you might try this game one more time. You might take the painkiller for a headache. May is a verb used in sentences to show a higher degree of possibility of the happening of an action or event. On the other hand, might is a past participle form of may, which is also used to show the possibility of the occurrence of an event, but only when there is a small degree of possibility. While we use may in the sentences which are factual and somewhat possible, might is used in the situation which is hypothetical, and the chances of possibility are quite less. You can use may in both seeking and granting formal permission from/to someone. Conversely, you can use might for seeking tentative permission only and not for granting it. Please take the car or else you may not be able to reach on time. Sunidhi may get the best singer award this year. It may take an hour to cover the distance. This may be my last visit to India. I might go to the hospital to visit my uncle. Atul might have lost his phone at the shop. She might not have noticed the change in your behaviour. Kirti might be working at home. While may is used in a situation where something is possible to happen, but you are not sure about it. On the other hand, might is used when there is a little possibility of the happening of a specific event.